This blog entry is part of a series. Read Part 1 here. 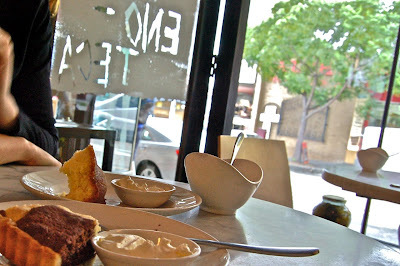 Leaving the hotel and heading right, a 2 minute walk will get you to Gertrude Street Enoteca. The word enoteca is Italian. Breaking down the word, you will see that it sounds like biblioteca (library) , having the suffix “teca” in common which means case or box. The “eno” prefix refers to wine, and so, putting 1 and 1 together, we have a wine library. Unfortunately, it was only 10 am, and I did not feel the need to start loading up with wine, regardless of the setting. So Elaine and I ordered coffee and cake, kicked back and enjoyed the surrounds. The coffee was fantastic, and the cakes fresh and tasty, and oh how good it was to have real cream with real vanilla seeds dispersed throughout, slightly sweetened with some caster sugar. We both agreed that even though the chocolate hazelnut torte was extremely good, the lemon cake won hands down. There is nothing like a simple, buttery cake, a small side of cream to make the heart happy. 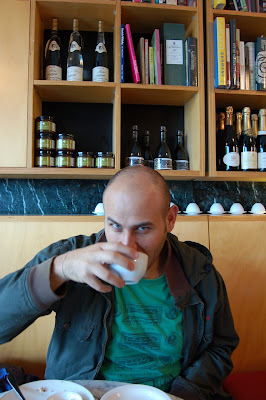 Try Gertrude Street Enoteca for a light lunch, or come for dinner where there is a limited menu with usually some form of meat (a bird or something similar). The focus is on local produce, and you can buy some hampers. The floor stocks some nice local products, but the room is tiny, so be early, or try to book. Oh memories of this place. I loved it. 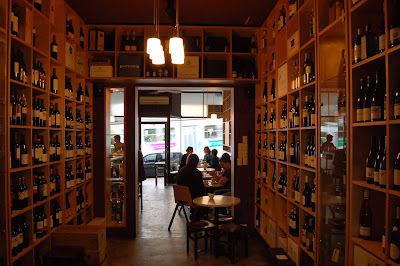 Such a relaxing space and to be surrounded by those wines…and the cook book shop up the road, it really is a foodies heaven. Hi there Fouad, happy to have met you at the World Chef Showcase – great talent all day long with Sebastien Bras, Fuchsia Dunlop, Yu Bo, Andre Chiang along with locals like Guillame Brahimi, Peter Gilmore and Mark Best. What a treat! Have a blast with your Food bloggers'dinner on Ocgtober 24 and next time I hope to be there too. Great to hear from you. What an awesome day, hey! Stay in touch, and you must start your own blog 🙂 Just do it! It's so much fun. I'll give you a heads up when we have a new secret dinner.